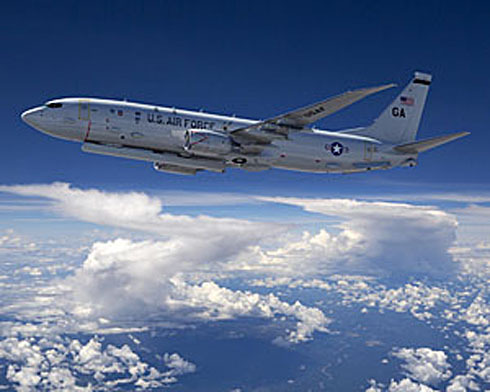 Ok, so it’s not remotely a UAV, but Boeing’s proposed replacement for the 707-based E-8 Joint STARS radar jets would do an awful lot of what we’ve come to associate with drones — spying-on and killing bad guys. As you may know, Boeing is pitching a new ground-scanning radar jet called P-8 Airborne Ground Surveillance based on the Navy’s P-8 Poseidon subhunter. If the plane is ever built and lives up to Boeing’s promises it will be able to scan giant swaths of the battlefield using a powerful APY-7 radar to find moving vehicles and take synthetic aperture pictures of the Earth. It will also be able to use high-resolution electro-optical/infrared cameras to zoom in on specific targets. Meanwhile, analysts in the back of the plane can pour over the data collected by its sensors or info from ground centers and possibly those of nearby UAVs — in real time. It can also feed intelligence back to an intelligence center or cue UAVs or fighters to attack bad guys. If a target needed to be hit immediately, P-8 AGS could drop a prescison-guided bomb from its internal weapons bay or one of four wing hardpoints that are wired to carry munitions. This is pretty close to “a single platform kill chain” — Boeing’s ad slogan for the plane. This entry was posted in Airplane Models, Diecast Airplane Models, Hobbies and Toys and tagged aircraft replicas, airplane models, Collectibles, desktop models mahogany models, Hobbies and Toys, military models, model airplanes. Bookmark the permalink.